When it comes to audio products, especially portable Bluetooth speakers, there are many different kinds of models to choose from, so much so that it could end up as an extremely complicated choice. Tivoli Audio has had experience rolling out quality Bluetooth-powered devices in the past, among them include the PAL BT Go illuminated portable radio. This time around, there is the limited edition DAB portable radio and Bluetooth speaker known as the PAL+BT. This is a re-engineered and award winning piece of consumer technology, ready to swing into action this summer in Lucite Green, Deep Ocean Teal, and Anise Flower colors. Tivoli Audio has always been a brand that looks forward to delivering both form and function in a single device, as they have worked with different brands such as Coach, Cappellini, and Fiat concerning other limited edition collections in the past. This exclusively designed collection is meant to be a reflection that has been inspired by the onset of spring and summer. “As a portable product, we wanted this collection to express the versatile nature of the outdoors during these seasons. The Salone del Mobile event is a great opportunity to combine the launch of these colors with the introduction of Tivoli Audio’s new engineered PAL series. The new models offer great sound quality, improved portable performance, and wireless technology, while maintaining a classic design,” shared Paul DePasquale, Chief of Product Design and Brand Development. 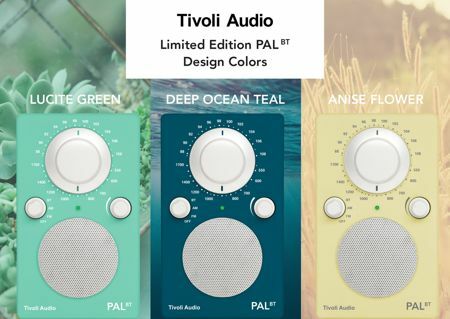 Do expect these limited edition colors to be made available for pre-sale when May rolls around, where it will feature both PAL+BT and the PAL BT (non-DAB) Bluetooth radios. After all, there is nothing quite like having a stunning looking Bluetooth radio or Bluetooth speaker to listen to wherever you go. No official word on pricing as at press time, but it should not burn a hole in your pockets, either.